Situated upon a bluff overlooking Lake Travis, this residence commands the land and water surrounding. The house is elegantly detailed yet ruggedly suited to the rough landscape. The house is divided into a main residence with a large kitchen at its core and a guest house. This arrangement allows the owners to accommodate visiting children and large crowds without living in a house that exceeds their everyday needs. The principal views are oriented towards the north, the view to the lake. As the house rises upward, the walls become more open, culminating in a 360-degree-view office at the third level and an observation tower at the fourth level. The exterior materials were selected to reflect the landscape: calico limestone, light painted stucco, and galvalume roofing; typical materials for the Texas Hill Country. This simple palette unfolds in striking manner. The stone and stucco are coursed in strong horizontal bands, while the metal roofing folds into oversized gutters. Cypress wood stretches in a continuous plane from the 8-foot soffit overhangs to the second-floor ceilings. The same material wraps down the staircase and up to the third-floor office and fourth level observation deck. A rustic limestone path leads to the front door of the main house. The cypress and glass door reinforces the horizontal motifs of the house design and ties into the wood soffits 20 feet above. The house is oriented with its long sides to the north and south, with the majority of the glazing on the north. 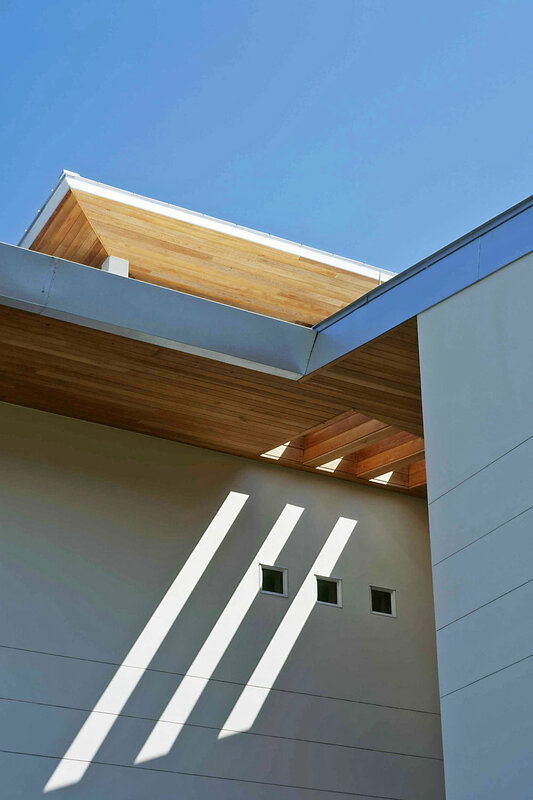 Deep overhangs protect the façade, while a breezeway separates the garage from the house. The pool terrace between the house and guesthouse provides a welcome place to catch the prevailing winds. The house can run entirely on rainwater that is collected from the barn roof into 20,000-gallon cisterns. The mechanical system uses geothermal coils to displace heat into the ground, eliminating the need for noisy condensing units while conserving electricity use.